Designer Pattern Swap and a California Sale – Everything Your Mama Made & More! Did you know that many PDF pattern designers are supportive of each other in the online world? It’s something I didn’t fully realize until I started assisting Kymy here at EYMM late last summer. I guess I just kind of assumed that there was a sort of “competition” for customers, but in reality most are friendly with each other and enjoy sewing others’ patterns. This week, a bunch of the designers got together to swap patterns and sew each other’s designs. Luckily for me, Kymy is deep in the designing phase for the next couple EYMM patterns so I got to “fill in” for her and trade patterns in the swap. My post will be coming Wednesday, but you can enter the giveaway and follow along to see everyone else’s creations over at Pattern Revolution! EYMM offered up the California Dress & Peplum Top in the swap and it will be sewn and shown off by another designer later this week. I wanted to whip up a couple Californias to include today because we have it on sale all week long! You can use the code CALIFORNIASUMMER to save 25% off the Women’s California, Girl’s California, or the Bundle of both size ranges. The sale code is good from now until 11:59pm PDT on April 27 only at www.eymm.com. 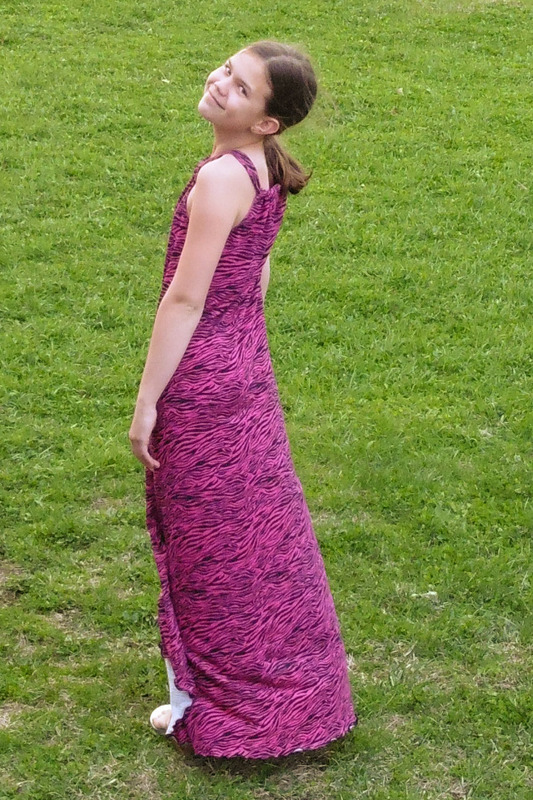 My oldest has been asking for another California Dress for a while now. 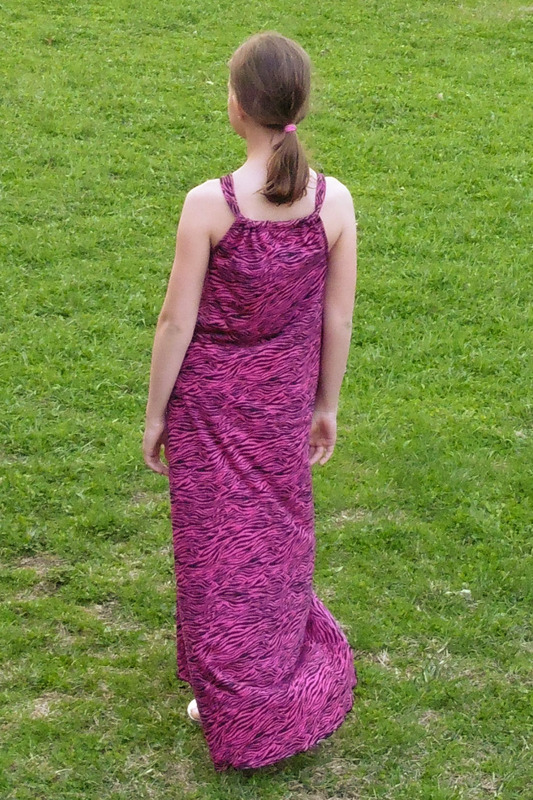 She’s a lover of all things zebra striped and so I knew this hot pink zebra knit would be a hit! She requested that I use the faux halter for both front and back of her dress and that the bottom be cut on the included hi-low curve (though it’s hard to tell since it was so windy when we took pictures!). Now if I can just figure out a way to stop her from growing up so quickly! 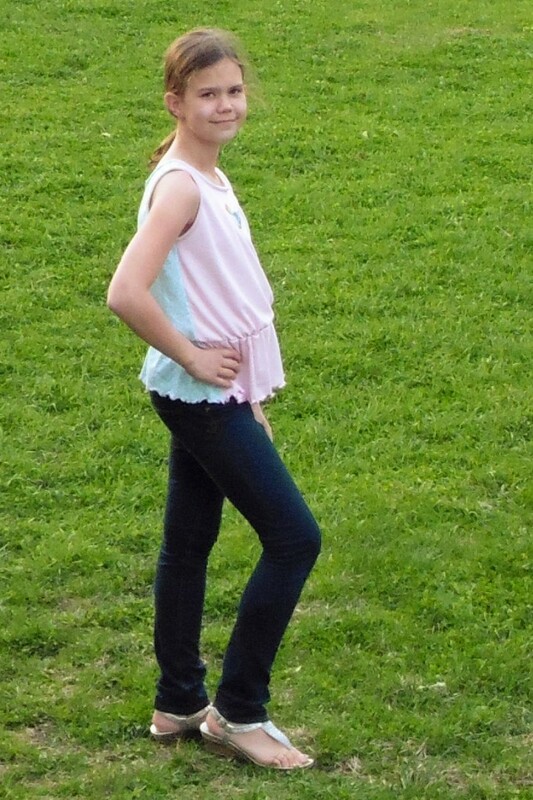 She’s wearing a size 12 width with the length of a size 16 because she’s almost 5’3″ … did I mention that she’s only 9 years old?!? 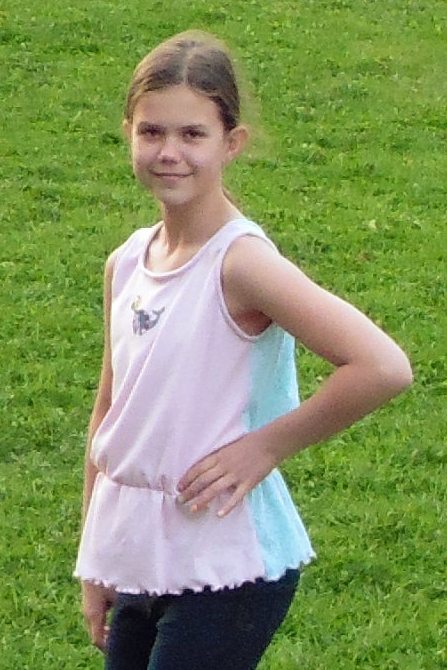 She definitely gets her height from her daddy and is only 3″ shorter than me now! 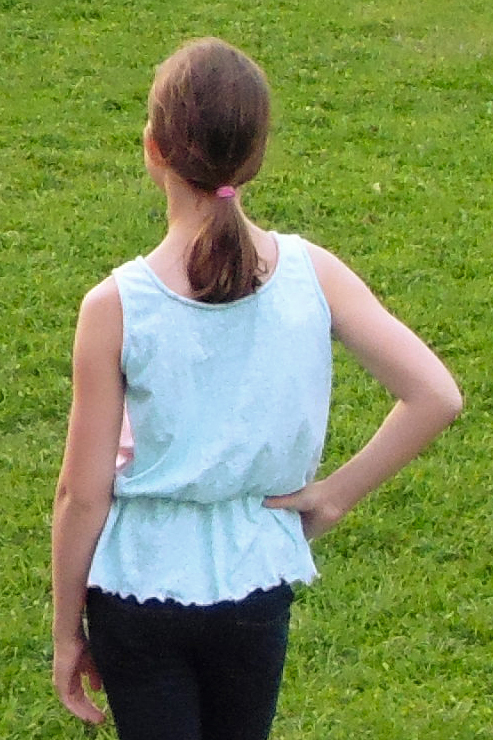 Since we used the faux halter bodice for the dress, we decided to also make her a scoop neck peplum tank for this summer. I love how versatile the California Dress & Peplum pattern is, with the two different bodices (you can also use one of each for the front and back) and the multiple length cutting lines that are included. 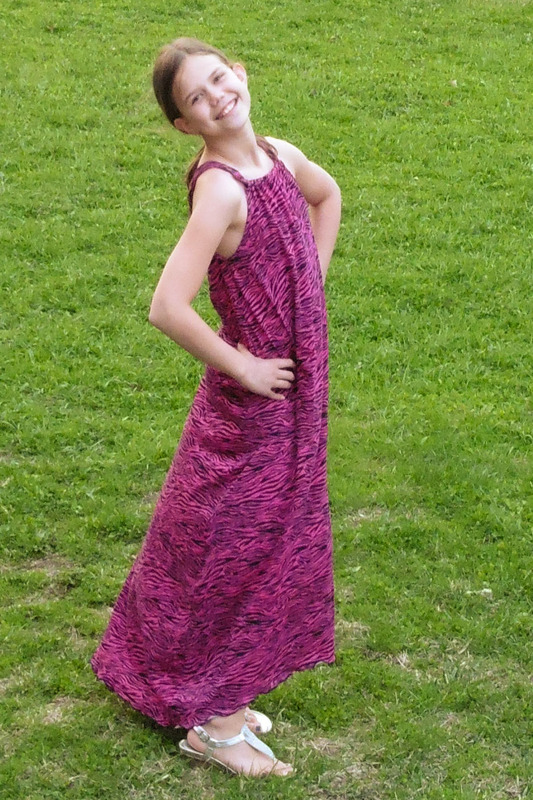 My daughter chose the fabrics for this one from my stash. The minty green swirls were left over from my Asymmetrical Drape Top Hack and the light pink is a very soft baby rib knit. Don’t forget to pick up the California Dress & Peplum while it’s on sale. Stop over at the EYMM Facebook page or join the Facebook group and share your creations or ask for help, if you need it. 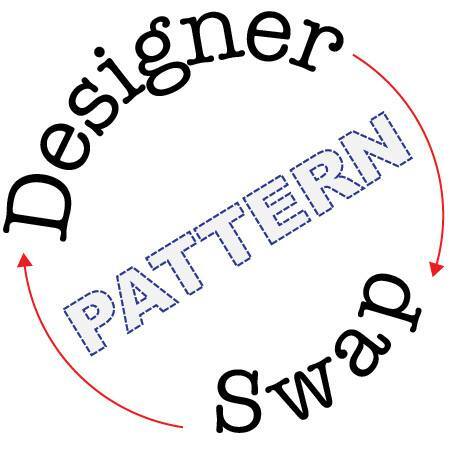 Remember to follow along with the fun of the Designer Patter Swap all this week over at Pattern Revolution or watch for the hashtag #designerpatternswap on Facebook. 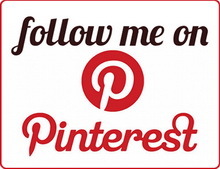 It’s going to be so much fun seeing what designers sew up using others’ patterns!